Imagine my excitement when the construction process of inset pockets clicked in my head. 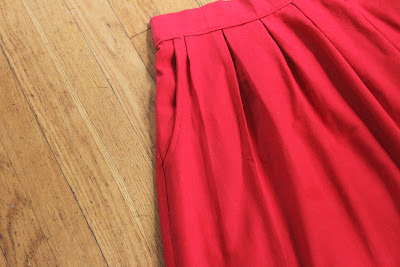 I felt like new doors had been opened, and realized that this newly found skill could be put to use to make an EmersonMade style skirt. Said red skirt is a present for one of my two sisters celebrating a birthday today- so happy birthday Lauren, and I owe you one, Allie!